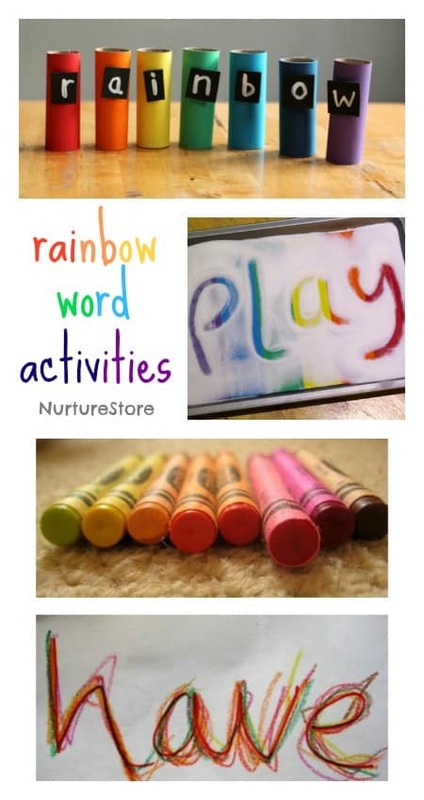 Here’s a whole range of rainbow themed literacy activities, including free printables. 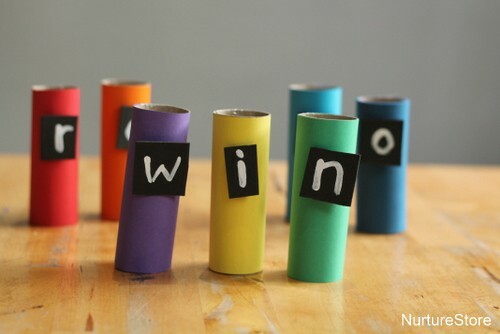 For our first set of games, we’re using the same set of DIY coloured paper rolls that we used for our rainbow maths activities, but with the number cards swapped for a set that spell out the word r-a-i-n-b-o-w.
And as with the maths activities, you can use the letter materials in different ways, to suit the age and stage your child is at. For very young children you might hide the paper rolls around the room and see if they can go on a treasure hunt and find them all. 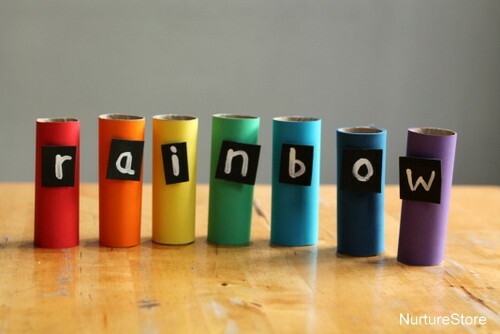 Can they recognise each letter, and spell out the word rainbow again? 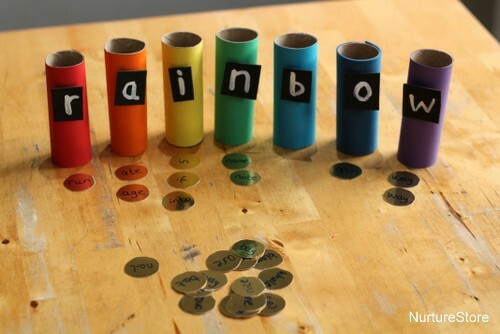 You can also use the rolls to play spelling games. Using the seven letters of the word rainbow, how many new words can you make? Younger children might be able to find simple consonant-vowel-consonant words like win, ran, and bow. Or you might be able to make four, five, or six letter words like worn, brown, and brain. 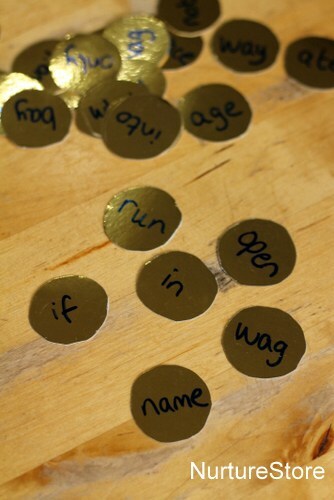 Using circles of gold card to make coins, you can write on some letters and words using a permanent marker. 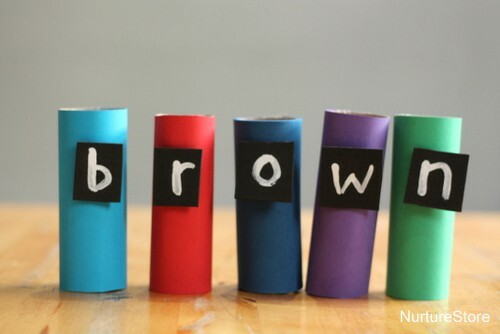 For very young children you might make indiviual letters r-a-i-n-b-o-w, and see if they can match each letter to the corresponding paper roll. You might write sight words on the coins, all which start with the letters r-a-i-n-b-o-w and see if you can read the words and match them up. Or make a set of coins that match the spellings, phonics or vocabulary words you are working on, to suit your individual children. One of our favourite ways to add in a hands-on sensory element to our writing and spelling practise is to use a salt tray. The children can use their finger, a stick or a paint brush to write in the salt and they get the brain-boosting effect of being able to really feel the letters as they make their marks. 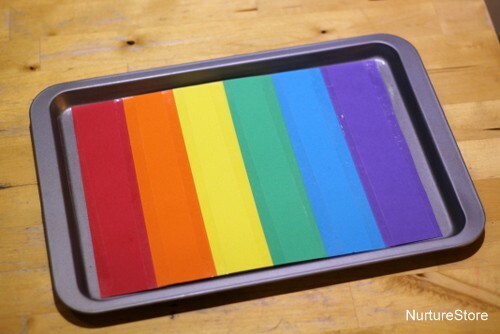 To go with our theme, it’s very easy to add a rainbow to your salt tray. I use a baking sheet that has edges on all four sides, which is a nice size to be able to write whole words in, and the edges help prevent spills. I made a rainbow stripe of card and laid it down underneath a cloud of white salt. As the children write their words, the rainbow appears! Again, this is an adaptable resource. Children at a pre-writing stage might like to make their own style of marks, or try loops, circles and other shapes. You can use it for practising individual letters or the alphabet, writing numbers, or drawing funny faces. All the activities help with fine motor skills, and pencil grip. 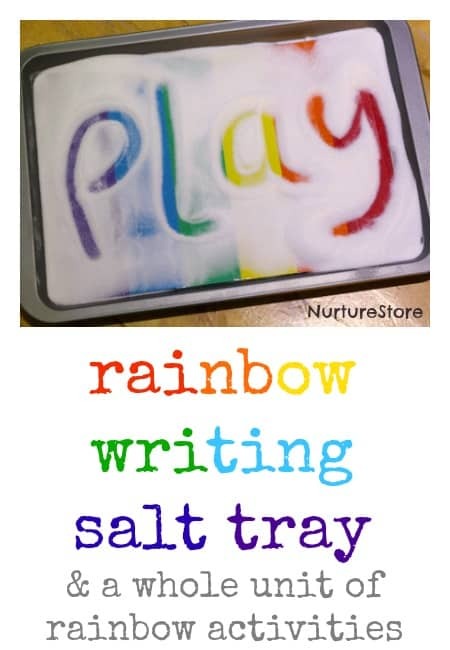 If your children is learning sight words or spellings, using a salt tray, rather than just a pencil and paper, is a fun, sensory way to help them practise. 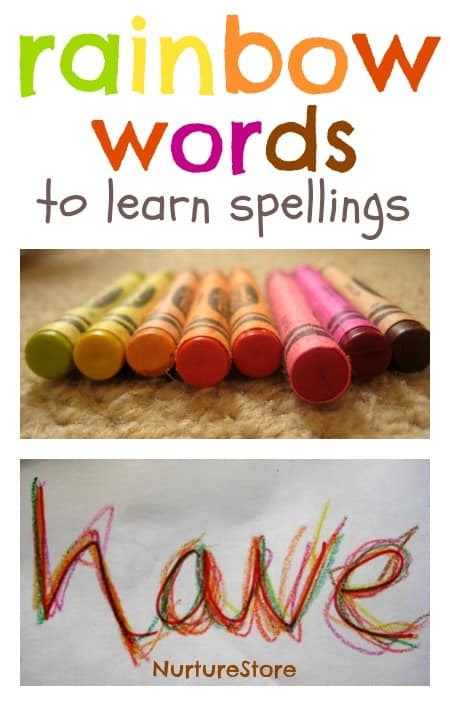 Take a look at these ideas for using rainbow words to learn spellings. Just discovered your posts. Looking forward to viewing more at a later date. I am so loving your Rainbow Coloured Salt Tray – Sensory. You see I use Coarse Cornmeal (Polenta), but can see how instantly attractive your idea is. Looking forward to trying it out. I also do numbers / shapes etc., on Sandpaper for chidren to finger trace and feel. 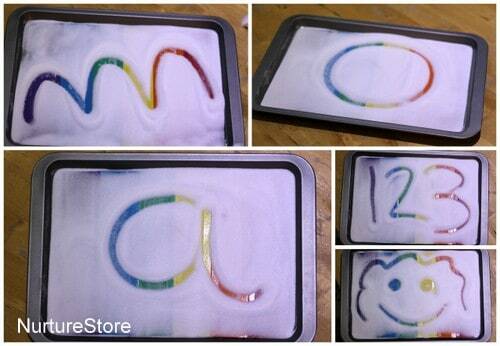 Absolutely love this idea as I was looking for an activity for children that recognise the letters of their name. This looks so attractive, appealing and striking. Great post! My kids have sensory issues and they would love it. I am linking to it for a post I’m doing this week on St. Patricks Day. Thank you. I love this idea which helps keep learning as fun and engaging as possible! I look forward to putting them in my classroom.